There are many character dining spots across Walt Disney World Resort. The atmosphere is fun and relaxed and every character makes a stop at every table taking time for autographs and photo opportunities. Character dining opportunities exist at Disney's resorts and theme parks. Meals — breakfast, lunch, dinner — times, menus, and character visits vary depending on the location. Don't forget your camera and autograph books. Character meals are the perfect setting for once-in-a-lifetime memory-making opportunities! Theme park character dining requires theme park admission plus the cost of the dining experience. Don't have children? No problem. These meals are a great experience for adults as well! If you're planning on your visit for a special occasion, specialty cakes are available for an additional charge. They should be ordered 48 hours in advance by calling (407) 827-2253. Do you have a special dietary need? Mention it at the time of making your reservation. Most special diets can be accommodated with advance notice. All character dining locations are non-smoking environments. For priority seating and reservations at any of the restaurants, call 407-WDW-DINE or 407-939-3463, up to 180 days prior to your visit or make online reservations at ​www.disneyworld.com/dining. Information on the following pages are subject to change. If you're vacationing with a princess fan, a perfect character dining experience might be the Fairytale Dining with Cinderella and friends at Cinderellas' Royal Table in Cinderella Castle. A royal welcome and a photo opportunity with Cinderella upon your arrival sets the scene for a storybook experience. The regal dining hall and its enchanting details provide a magical backdrop for little princesses to mingle with their favorite Disney princesses. 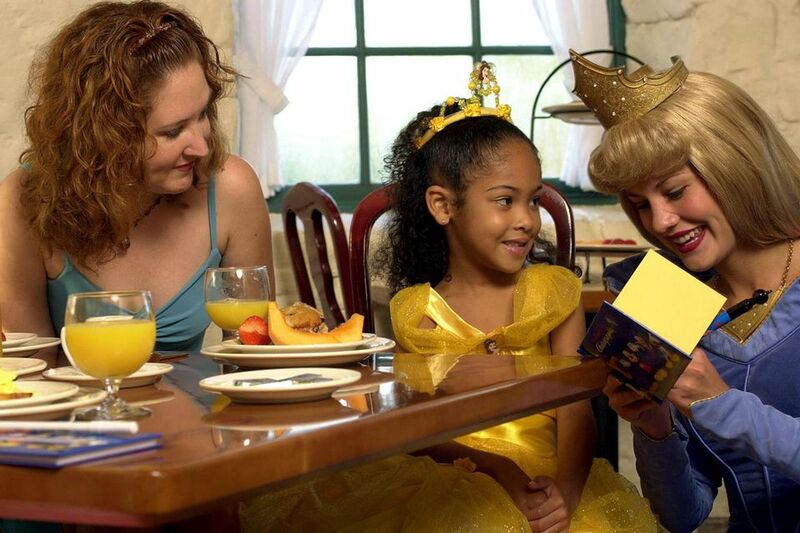 Fairytale Dining with Cinderella and friends includes a photo imaging package. The package includes one professional imaging package for groups of up to four paying guests; five to eight guests receive two imaging packages; and, groups of nine to 12 guests will receive three imaging packages. Each imaging package is delivered in a Cinderella-themed photo holder and includes one 6" x 8" and four 4" x 6" prints and one 6" x 8" print of Cinderella Castle. Breakfast is served from 8:05 to 10:40 a.m. as a pre-plated all-you-care-to-eat meal featuring American breakfast favorites. The prix fixe menu for lunch includes a specialty appetizer, choice of main course (children's menu available), beverage and dessert. Lunch is served from 11:45 a.m. to 2:40 p.m.
Little princesses and the Lords and Ladies accompanying them will dine like royalty on a prix fixe menu (children's menu available). Reservations required. Dinner is served between 3:50 to 10:00 p.m. This character dining experience requires admission to the Magic Kingdom as well as the cost of the meal. Keep your camera and autograph book handy during the character meal. Princesses will visit each table for photo and autograph opportunities. Have a special dietary need? Let the cast member know when you make your reservation. The separate buffet for kids at this character dining location is a hit with the little folk because it's stocked with all their favorites — macaroni and cheese, pizza, green beans, marinara meatballs and more! Pooh fans will love this character dining experience as the bear and his friends make special appearances throughout each day. Breakfast is served 8:00 a.m. to 10:30 a.m. Lunch between 11:30 a.m. and 3:00 p.m.
Dinner begins at 4:00 p.m. and continues until closing (depends on park closing). Keep your camera and autograph book handy during the character meals. Pooh and his friends will visit each table for photo and autograph opportunities. Located on the second floor of The Land pavilion, the Garden Grill is the location of Chip 'n' Dale's Harvest Feast. The rotating restaurant features all-you-care-to-eat, family-style dinners and a view of Living With the Land attraction where some of the vegetables you are served may have been grown. Of course, the highlight of the meal is a personal table-side visit from those mischievous chipmunks. Lunch between 11:00 a.m. and 3:00 p.m.
Dinner begins at 4:30 p.m. and continues until closing (depends on park closing). This character dining experience requires admission to Epcot as well as the cost of the meal. Keep your camera and autograph book handy during the character meals. Chip 'n' Dale and friends will visit each table for photo and autograph opportunities. The medieval castle atmosphere sets the scene for Princess Storybook Dining at Akershus Royal Banquet Hall in the Norway pavilion at Epcot's World Showcase. Belle, Jasmine, Snow White, Aurora, Mary Poppins, Pocahontas, Ariel, Alice, and Mulan are all on hand for this fantasy experience. Princess Storybook Dining includes a photo imaging package. The package includes one professional imaging package for groups of up to four paying guests; five to eight guests receive two imaging packages; and, groups of nine to 12 guests will receive three imaging packages. Each imaging package is delivered in a themed photo holder and includes a photo taken upon arrival with one of the Disney princesses. Breakfast is served from 8:30 to 10:10 a.m. and features American breakfast favorites. Lunch is served from 11:40 am. until 2:50 p.m. and includes an authentic Norwegian cuisine. Dinner is served from 4:20 through 8:40 p.m., featuring an authentic Norwegian cuisine. Keep your camera and autograph book handy during the character meal. Princesses, leading ladies, and friends will visit each table for photo and autograph opportunities. The Hollywood & Vine restaurant at Disney's Hollywood Studios is where you can join Disney's Little Einsteins and Handy Manny for breakfast and lunch. Both buffets feature Handy Manny, June, Leo and Special Agen Oso for fun-filled, musical meals that feature Disney Junior tunes. Dine on Mickey Mouse-shaped waffles and other favorites at the buffet breakfast from 8:00 and 11:20 a.m. Lunch is served from 11:40 a.m. until 2:25 p.m. with another musical featuring more singing and dancing. This buffet features child- and adult-friendly choices, including assorted deli selections. This character dining experience requires admission to Disney's Hollywood Studios as well as the cost of the meal. Keep your camera and autograph book handy during the character meals. Friends from JoJo's Circus and Little Einsteins will visit each table for photo and autograph opportunities. Have a wild time with Donald Duck and friends at Tusker House Restaurant in Harambe at Disney's Animal Kingdom. Donald Duck, Daisy Duck, Mickey Mouse, and Goofy provide a rip-roarin' start to your morning with a breakfast buffet of mostly American fare, but also includes a few unique African-inspired dishes. Breakfast is served buffet-style from 8:00 a.m. until 10:30 a.m. daily. This character dining experience requires admission to Disney's Animal Kingdom as well as the cost of the meal. Keep your camera and autograph book handy during the character meals. Donald Duck and friends will visit each table for photo and autograph opportunities. These special character dining opportunities at Disney World's resort hotels provide guests with unique character greeting experiences, as well as delicious meal options from some of Disney's top chefs. Start your day with Goofy and friends at Cape May Cafe at Disney's Beach Club Resort. The "Beach Club Buffet" is served from 7:30 a.m. to 11:00 a.m.
"Chef Mickey's Fun Time Buffet" at Disney's Contemporary Resort is visited twice a day by Mickey and his gang. Breakfast is from 7:00 a.m. to 11:30 a.m. and dinner is served from 5:00 p.m. to 9:30 p.m.
Disney's Grand Floridian Resort & Spa plays host to the "Supercalifragilistic Breakfast" at 1900 Park Fare with Mary Poppins and friends in attendance from 8:00 to 11:10 a.m.
Disney's Grand Floridian Resort & Spa hosts a "tea party" lunch for children with Alice and the Mad Hatter from 1:30 to 2:30 p.m. Monday through Friday. The "​Wonderland Tea Party" is held at 1900 Park Fare. You can attend "Cinderella's Happily Ever After Dinner" at 1900 Park Fare in Disney's Grand Floridian Resort & Spa for a delightful dinner buffet with Cinderella and friends from 4:30 p.m. to 8:20 p.m. daily. A family-style breakfast can be enjoyed daily at Disney's Polynesian Resort. Lilo and Stitch will join you at the "Ohana's Best Friends Breakfast" beginning at 7:00 a.m. and serving until 11:00 a.m. These character dining opportunities do not require theme park admission, nor do you have to be a registered guest at the resort. However, reservations are a must! Keep your camera and autograph book handy during the character meals. All characters visit each table for photo and autograph opportunities during the meal.